We’d love your help. Let us know what’s wrong with this preview of Frost & Filigree by Natania Barron. They have worked behind the scenes of society for centuries, protecting humans from threats beyond their understanding. They are The Shadow Council, and these Archives are the stories of their members and adventures throughout recorded history. From folk heroes to monsters out of darkest nightmare, the Shadow Council Archives explore the world beyond mundane understanding. They have worked behind the scenes of society for centuries, protecting humans from threats beyond their understanding. They are The Shadow Council, and these Archives are the stories of their members and adventures throughout recorded history. From folk heroes to monsters out of darkest nightmare, the Shadow Council Archives explore the world beyond mundane understanding. Vivienne du Lac and Nerissa Waldemar -- a.k.a. la belle dame sans merci and the lamia -- have been living among the elite of Tarrytown for quite some time, undetected but for the trail of goats in their wake (one must eat, after all). But just as their eccentricities begin to raise eyebrows, a dark evil arises, intent on murder. They meet a with a young woman named Christabel Crane and a group of bumbling cultists calling themselves the Circle of Iapetus, who beg for help combating the creature. 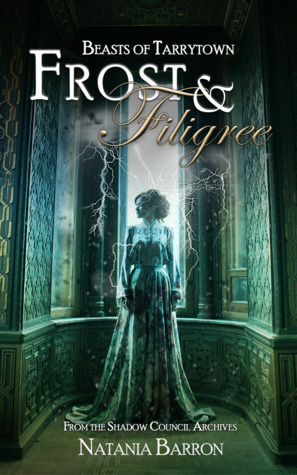 To ask other readers questions about Frost & Filigree, please sign up. Mesmerized by the deep, unfolding characters. It's not a big book, yet it has big magic packed inside it. The author must be a faery's child - hair long, foot light, eyes wild, brain quick, heart open - bleeding love. This was so so good but TOO SHORT! I mean I know it's a novella but still :p Complex, engaging, funny characters, and an exciting story that was over much too soon. Looking forward to the next installment! Like Little, Big, Strange & Norell, crossed with Supernatural. A very good, immersing read that will keep you entertained, no doubt. But it also has amazing prose, very reminiscent of great Victorian classics, but with it's own spin on things. Must read. What a wonderous romp! I can't wait to read what happens in Cairo in the upcoming Masks & Malevolence. Nerissa is my power creature, but all the Beasts of Tarrytown are multi-faceded gems in an opulent setting. Natania Barron is a writer with a penchant for the speculative; she is also an unrepentant geek. Her work has appeared in Weird Tales, EscapePod, The Gatehouse Gazette, Thaumatrope, Bull Spec, Crossed Genres, Steampunk Tales, Faerie Magazine, and in a number of anthologies. Her work often incorporates Victorian aesthetics with magic and science fiction, treading between genres whenever possible. H Natania Barron is a writer with a penchant for the speculative; she is also an unrepentant geek. Her work has appeared in Weird Tales, EscapePod, The Gatehouse Gazette, Thaumatrope, Bull Spec, Crossed Genres, Steampunk Tales, Faerie Magazine, and in a number of anthologies. Her work often incorporates Victorian aesthetics with magic and science fiction, treading between genres whenever possible. Her first novel, Pilgrim of the Sky, debuted in 2011. Her novella, Wothwood, published in February 2017, and Frost & Filigree published June 2017. Her first non-genre book, ROCK REVIVAL released in July of 2018. 2019 will see the second two volumes in the Frost & Filigree trilogy. Natania is also the founder of The Outer Alliance, a group dedicated to queer advocacy in speculative fiction.